This office space is located on the University of Essex’s Colchester campus. The work space offers both fantastic co-working space and private serviced offices and also has the virtual office option. The high quality of the building and the great accessibility, makes this a very appealing place to work. The business centre is located 1.6 miles from Hythe Train Station and just two miles from Wivenhoe Train Station. Located just 1/2 mile off the A12, 2 miles north of Colchester Business Park, this centre is close to the railway station and not far from the local airport. This centre provides a self contained office with its own entrance, with room for three work stations and a meeting area. Also offering self contained offices for up to 10 persons. This modern business centre houses a magnificent atrium with dining area, and impressive spacious reception. The air-conditioned office spaces and meeting rooms are available in a range of sizes and leasing arrangements. The state of the art IT and telecommunications systems can be tailored to suit. The premises are located close to Colchester town centre and train station, with easy access to the M25, A12 and Stansted Airport. 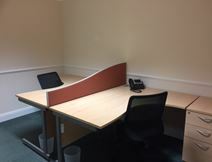 Located within easy walking distance of Colchester town centre, and a mile away from the railway station, this serviced office space is unfurnished and available immediately. A barn style development located in a countryside business park just off the A12 outside Colchester. A variety of bright, uncluttered office units are on offer. Full cleaning and maintenance, mail and meeting room services are available. The site features attractive gardens and car parking, perfect for those driving to the office. The property is located adjacent to the A12/A120 interchange so road access is excellent. Set in the heart of Colchester, this centre offers cost-effective, professional workspace filled with amenities and benefitting from a great location. The centre is housed in a fantastic Grade II listed building, offers suites for up to 8 people and flexible terms. All spaces come furnished. Colchester town centre is on tenant's doorsteps, and the town's train station is just seven minutes walk and offers a direct service into London Liverpool Street.